Blues, R&B, Soul and five days of bliss in the sun by the river. June 30-July 4...and all for the Oregon Food Bank. 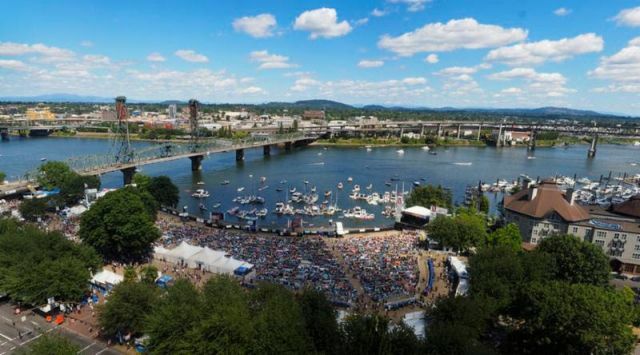 The Safeway Waterfront Blues Festival is thirty years old? Really? This is OMN's eighth year as a media sponsor, in our booth in the Louisiana Pavillion? True dat. You can find it at the north end near the Front Porch Stage. Well, you know what happens when you're having fun. There are lots of festivals around here, but this is the biggest. Lineups change, great musicians come and go, live and die, but like the Willammette to which it lives next door, the festival rolls on. It is, as always, to benefit the Oregon Food Bank. Please come see us in our booth, we'll have a small but sweet magazine for you with some of the performers you might not be aware of. That's one of the fabulous things about the Festival. Artistic Director Peter Dammann keeps finding fresh musicians to keep us satisfied, as well as bringing in our favorites. We'll have our photographers and writers on board to bring you the sights. Everyone is looking forward to the return of Curtis Salgado in his first major performance since his heart surgery. He'll be at 7pm on July 4. Here's how to find the things you need. Details you might want to know about. Peter Dammann did one of our Coffeeshop Conversations during which he ran down all of the performers. You'll learn all about bands who have never played the Festival before and....well, everyone else.